Zadnji put si ovdje bio: 23 tra 2019 18:31. Sada je: 23 tra 2019 18:31. Hello again, guys! The Teslacigs XT Mini kit I shared just now may be a little expensive. Don't worry, this time I bring you a cheap box mod. And because it is the mini version of the VOOPOO Drag box mod, so we call it Drag Mini. Now let's take a look together. VOOPOO Drag Mini Vape Mod has the same design style like VOOPOO Drag but comes with a little smaller size. In addition to its high-end technical design, which is very streamlined with a colorful resin panel on one side, the mod also looks modern. On the control face, you will see a crystal clear OLED display with a menu that displays the current battery level, mode, resistance or voltage, and wattage. Powered by a built-in battery with the newly updated chipset, it also supports VW/VPC/TC/TCR/BYPASS mode. 4 colors are optional. I think you may have been attracted by the VOOPOO Drag Mini Mod already. 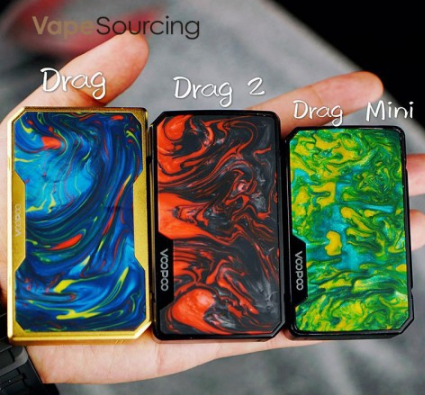 But if you are not clear about choosing which atomizer to combine a full kit, don't worry, VOOPOO Drag Mini Kit is available in vapesourcing online shop now. Hey guys! VOOPOO DRAG Mini Kit is in stock in vapesourcing online shop now. Shipping within 48 working hours.